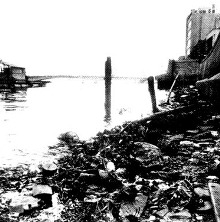 Postwar Sumida River waterfront was occupied by factories and warehouses, was deteriorated like a ditch, and was shunned by people. At the same time, industrial and logistical structure changes sap the area’s vitality as a production base. But increasing interest in environment headed for the semi-ruined city waterfront and a possibility of its restoration emerged and city-and-river development started, thus attractive urban area was gradually created. The water quality of Sumida river was remarkably low in 1950s because of the industrial/domestic wastewater generated from rapid industry development and urbanization. However, after the Olympics held in Tokyo in 1964, the water quality was significantly improved by popularization of sewage water treatment system and more stricted restrictions. Sumida river is characterized by 1) general river slope which promotes stagnant area 2) large effect of sea water that goes upstream 3) 60% of river water is treated sewage water. Therefore, efforts are being made to improve the water quality by modifying sewer system and introducing advanced waste water treatment. 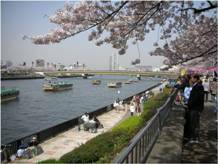 In Asian nations with worsening river environments, Sumida River, improving after experiencing 50-year deterioration is a leading example in Asia.